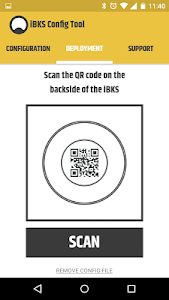 READ BEFORE DOWNLOAD: This application only works with the iBKS models with firmware version V5.0 or higher. Through this app, older firmware versions MAY BE UPDATED to the latest one by using the integrated DFU. 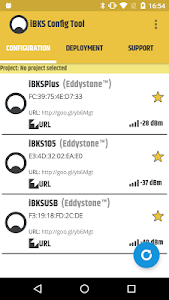 IBKS Config Tool is an App which will allow you to scan and set up the beacon models iBKS105, iBKS Plus and iBKS USB with firmware v5.0 and above manufactured by Accent Advanced Systems SLU company. 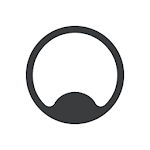 - Associate the app to a google account and beacon projects on Google Developers Console to manage the iBeacon, Eddystone UID and Eddystone EID registration. 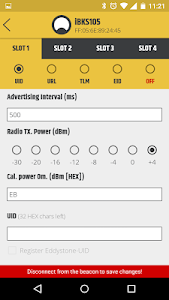 - Scan all the available beacon devices around and view the device MAC address, the advertising packets in real-time and if the beacon is in connectable mode or not. 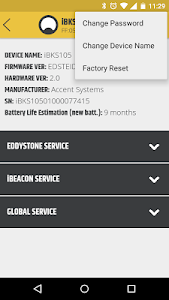 - Connect to iBKS beacon devices in connectable mode, view and modify the following characteristics: iBeacon slots, Eddystone slots, device name, password, connectable modes and factory reset. - Add the deployment file to check the factory parameters set associated to a specific beacon by a QR Code. 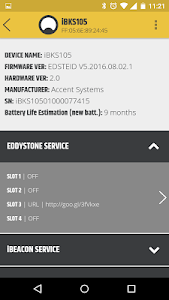 - App only available for devices with Bluetooth Smart LE v4.0 and Android 5.0 or newer. 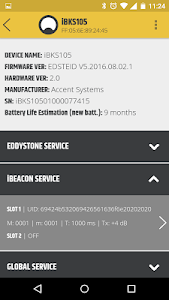 - This app was specially designed to setup the Beacon devices models iBKS105, iBKS Plus and iBKS USB with firmware v5.0 and above manufactured by Accent Advanced Systems SLU. 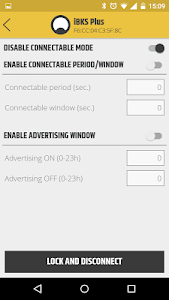 Through this app, older firmware versions MAY BE UPDATED to the latest one by using the DFU integrated. NOTE: App tested and working on devices: Nexus 7, Nexus 5, Moto G, Moto G4 Plus, Motorola 3 Gen., Samsung Galaxy S4, Nexus 5x and One Plus 3.